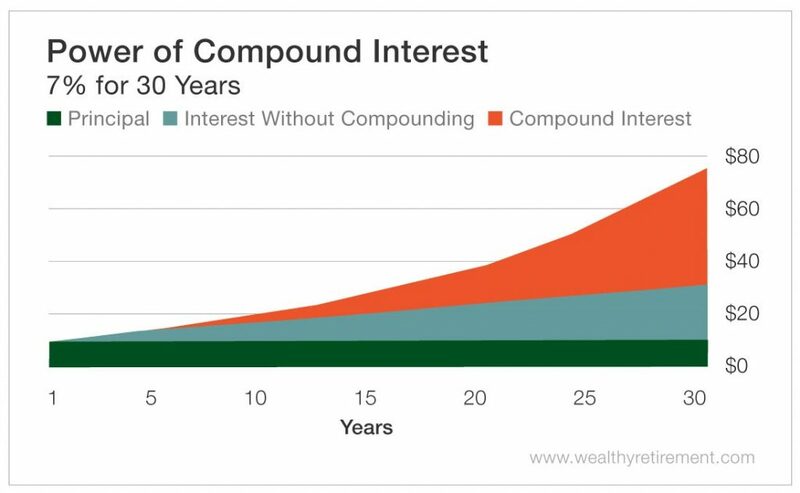 Compound interest is one of the most useful (and powerful) concepts in finance. It takes the interest you earn each year and adds it to your principal so that the balance doesn’t simply grow; it grows at an exponentially increasing rate. The Compound Interest Calculator below not only highlights the value of personal savings, it also illustrates the importance of paying down debt. It might seem complex but breaking it down into pieces helps with understanding how it works. FV is the future value and it’s the number you’re trying to find. PV is the present value or the investment starting point. i is the annual interest rate. n is the number of compounding periods in the year (see below). If you contribute more savings to the investment over the years, you should factor in those savings. You can use this formula for various cash flows and add the results together. The more times you can compound your interest, the larger your investment will grow. That’s why it’s important to start sooner than later. Whether you’re borrowing money or investing, always look at the compounding periods. Our compound interest calculator above limits compounding periods to 100 within a year. Compound interest is a powerful concept and it applies to many areas of the investing world. You can learn more about supercharging your retirement savings with our free newsletter by Clicking Here!